In conjunction with the Cincinnati Preservation Association, the Over-the-Rhine Foundation has prepared a presentation that answers the question, “Why does Over-the-Rhine matter?” Links to PDF files are at the bottom of this page. It illustrates why Over-the-Rhine is a community worth protecting and preserving – not just to its residents or even to people living within the city, but to the economy and image of the entire region. We love to share the presentation with interested groups. If you would like to invite us to one of your meetings or events please Contact Us. Over-the-Rhine is not just another neighborhood. It is the historic northern half of downtown Cincinnati and one of the largest urban historic districts in the United States. Both in size and architectural significance, it is comparable to New Orleans’ French Quarter and the historic districts of Charleston and Savannah. Just as New Orleans, Charleston and Savannah have become defined by the revitalization of their historic districts, Cincinnati is defined by its failures in this arena. These cities are beloved for saving and leveraging their historic districts, while Cincinnati has let its historic downtown deteriorate through years of disinvestment, blight, and crime. Charleston was recently named the third best travel destination in the United States. The city’s mayor, an ardent proponent of historic preservation, largely credits the city’s “history and character” for the ranking. Charleston’s historic district has some grand mansions on the water front, but most of the buildings have the same architectural styles as those in Over-the-Rhine. A 2006 study shows that Over-the-Rhine land values should be between eight and 11 times greater than they currently are, resulting in a loss of county tax revenue. A 2007 study shows that designation as an historic district can appreciate land values by as much as 100%. The neighborhood’s walkability, density, and hundreds of mixed-use, vacant buildings inspire a realistic vision to transform Over-the-Rhine into America’s “greenest” historic neighborhood. Historic rehabilitation creates more jobs than new construction and retains more money in the local economy. It also leads to the creation of new jobs through neighborhood redevelopment. Properly redeveloping Over-the-Rhine would have more impact on the regional economy than the Banks project. With essentially no support or encouragement, Over-the-Rhine has a budding tourism industry. With just a little support, it could be a major economic driver. 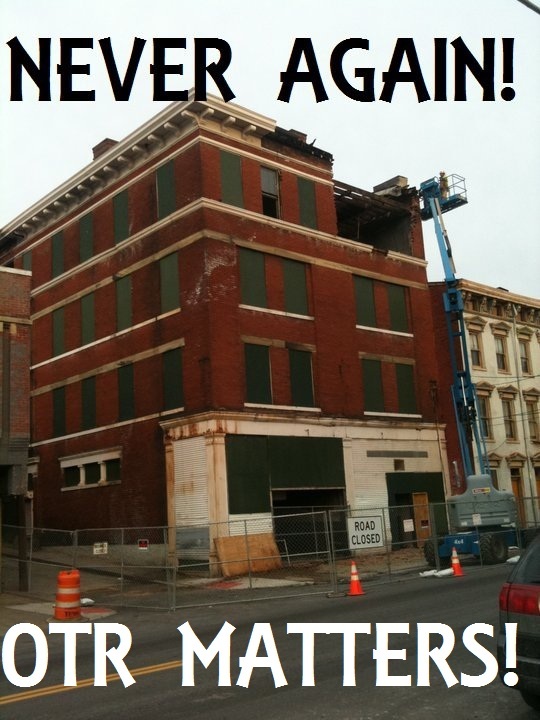 In 2006, Over-the-Rhine was placed on the National Trust for Historic Preservation’s list of the “Eleven Most Endangered Places in America.” In the first four years since that designation, more than 10 historic properties were demolished, and the destruction continues.